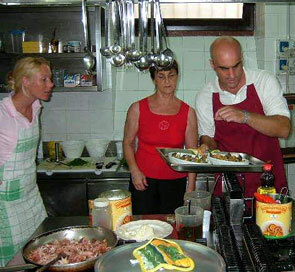 These hands-on cooking classes begin at 9 am at Ristorante Cin Cin in Via Manin, 22, just off Palermo’s main shopping district. Classes are limited to a minimum of 2 people and a max of 8 people and usually last until 1:30 pm. We will venture to one of Palermo’s historic markets (Il Capo, La Vucciria or Borgo Vecchio) were we will purchase all the ingredients necessary to prepare our meal. Along the way, we will also taste some of Palermo’s most typical foods, such as “panelle” and “pane con la milza”. The lunch that you've prepared will be served with just the right Sicilian wine, and dessert accompanied by local biscotti and Sicilian dessert wine. Tour type: Private cooking class. On demand we can we can arrange for a pick up from from a Palermo hotel/ accommodation or from Palermo port of call.